Scott and Dominica’s 2008 Disney Flickr Set. Today is our big “park” day in Walt Disney World. Epcot opens early this morning at eight o’clock so our plan was to be up early and get it as soon as the gates opened for resort guests, but I was so tired after getting almost no sleep for such a long time and getting so little yesterday that I just wasn’t able to get up that early today. Dominica was up and ready to go long before I was. We did manage to still get up at a reasonable time and were down at the Roarin’ Forks cafeteria getting breakfast around seven thirty. Not nearly as early as we had hoped but not too shabby, all things considered. We just did a simple continental breakfast at Roarin’ Forks. All of Disney is full of great bakery items. There are many bakeries around WDW all turning out incredible fare. We took the bus from the Wilderness Lodge to Epcot which was pretty smooth. It was just after eight thirty when we walked into Epcot. There were not very many people there which worked out great for us. Our first stop, obviously, was Spaceship Earth. We were both very excited to have a change to ride Spaceship Earth as it has just completed a new, and sorely needed, refurb. This is the refurb that we have been expecting now that Siemens has taken over sponsorship of the pavilion after AT&T dropped it some years ago. There was practically no line at all for Spaceship Earth this early in the morning. It has not been a “hot” ride for a very long time as it is one of the original 1982 attractions but it is a classic and it is extremely well done – although I believe it to only be the third best of the four original attractions of its type: World of Motion, Universe of Energy and Horizons. The update was very well done, in my humble opinion. The ride was shut down for a while and all of the sets were cleaned and the clothing washed and that sort of stuff which was pretty important as the ride was beginning to look pretty drab when Dominica and I rode it last year. Jeremy Irons, who had done the narration for the rides last update which was some time ago, was replaced by Judy Dench for this latest update. The story line of the narration was changed and one of the animatronics scenes was changed (Greeks now do math rather than theatre) so that the entire exhibit is skewed towards the Internet rather than legacy telephone communications although the two are closely related and really only minor changes needed to be made. Towards the end of the “first section” (the “first section” being the part of the ride when you climb into the ball and the “second section” being the part when you are descending out of the ball) the silly old vignette of people using video phones (or whatever that was supposed to be) was removed and a vignette of Steve Wozniak working on the prototype of the Apple computer (the Apple 1 kit, not the Apple ][) was put in its place. Dominica was very impressed as I turned to her and said “that’s Steve Wozniak” when the Judy Dench narration hadn’t explicitly mentioned who was being represented in the example of the beginnings of the personal computer. She had known already who it was having read about the ride online but didn’t tell me so that she could see if I would guess it. I had no idea that she was waiting to see if I knew who it was and I recognized Wozniak (whom I have met in person) from behind leaning over a desk. At the intro to Spaceship Earth there was always a “slide show” or something similar that showed faces of cavemen before going on to show the cavemen vignette. This has been replaced with a video of cavemen fighting a woolly mammoth which is a huge improvement without affecting the original “intentions” of the ride. All throughout the ride the movements and actions of the animatronics seem to be improved and some new affects, sounds and music have been added or updated. It feels a little bit less like the ride was made in 1982 now. The second half of the ride has been complete changed which is good as the old AT&T ending was horrendous even when it was new. The ending portion of the ride is a tough challenge, I am sure, for the Disney Imagineers as they use all of their available physical space in building the first half of the ride leaving the last half with little more than a dark tunnel in which the riders must descend backwards (for safety and comfort reasons.) The old ending was little more than twinkling lights and was positively annoying to have to ride through. The new ending is cute and very funny even if cheap and not very inventive. Replacing the old second half of the ride is now a “choose your own future” thing done on a little screen that has been built into your “car”. This is a throwback to the same feature on the Horizons ride by GE back in 1982. Only this time instead of just three possible endings you get to pick from dozens. I’m not sure that this is better for Disney than the three endings of Horizons, though, as the three ending options gave riders a reason to ride the ride three times to see if they could see all three endings each of which was completely different from the others. But this selection processes of dozens or scores of endings is far too many for anyone to attempt to see them all and most of the endings overlap with each other and are not truly unique. So only riding a few times nets you anything very valuable in the way of final endings. The way that the endings work is that, at the beginning of the ride, your picture is taken and at the end you face is put onto the body of cartoon characters who are shown going about their day in the future based on technologies that Siemens is current working on. It is an interesting concept and can be very funny but is just an elaborate version of the Christmas Elf greeting card that my dad has been sending for the last few years. In fact, it doesn’t look quite as good as that card because there is no manual editing of the pictures and the pictures are taken using a cheap camera from too far away in a poorly lit space. So the elf card has an advantage. So while it is cute and funny it is not innovative and ends up being an example of where Disney has failed to keep their park updated in such a way that it is not being overtaken by technologies that people now possess at home. The entire last half of Spaceship Earth ride is literally something you would expect to see on some company’s web site in a section that no one really goes to because it is silly and meant for kids. It isn’t bad – but it isn’t really impressive either. When you get off of the Spaceship Earth ride Siemens has their little advertising area there where you can interact with Siemens displays and get a feel for what they do as a company. One cool thing that they did is show everyone’s pictures up on a huge display with a giant map and then it places people’s faces onto the map so that you can see from whence people are coming. Then you can go to a little computer terminal and select your picture and send it to yourself via email so that you have a greeting card of your ride. That was a nice touch and given that the ride uses some very standard “at home” technologies at least they carried it through and did all the things with it that you would expect to be able to do these days. So that was a nice touch. It is important to note that none of the changes in Spaceship Earth were for the worse. Some didn’t go as far as we would have liked but none of them took away from good parts of the ride. Spaceship Earth is definitely now a better ride, or just as good in some places, as it was last year or in 1982, for that matter. So this is one update that we are very please that Disney has completed. Ever since Horizons become Mission to Mars and the World of Motion became Test Track we have feared that Spaceship Earth would become a big cheesy tilt-a-whirl or some other cheap carnival ride. After riding Spaceship Earth, Dominica’s favourite ride, we headed on over to Nestle’s The Land for my favourite ride “Living with the Land”. We never go through Epcot without riding on Living with the Land at least once or twice. It is so peaceful and relaxing and since it is a real, living exhibit there is always some change worth noting in the greenhouses. This year there are no real changes to the ride from last year except that the audio system seems to have been fixed and is no longer cutting in and out. The last time that we were riding on the ride the human narrator had just been replaced by the prerecorded narration and the kinks hadn’t been worked out yet. After The Land we headed on over to Exxon-Mobil’s Universe of Energy which was updated many years ago but is still pretty good. It could use another update though. Partially just because it is old and partially because so much has happened in energy production in the years since it was originally installed. Ellen hosts it and it would be nice if they got her back to do it again because she did a really good job and they themed it with some stuff in the Animal Kingdom’s Dinosaur area with her as well which worked out pretty well. And Jamie Lee Curtis did part of the show which is awesome. I do feel like they did a couple of minor updates and I think that there is a dinosaur that squirts water into the audience that didn’t do that before – and it managed to get me square in the face too! Then it was off to the world showcase. There was a line at the Finding Nemo ride and we weren’t too thrilled with it last year and can happily wait to do it again until next fall when we are planning to return with Dominica’s entire family for more than a week in the parks. No reason to do anything now that we don’t really want to do. We actually did everything in Future World early enough (everything that we cared to do, that is) that we got to the World Showcase and had to wait almost half an hour before they opened. So we just hung out in the gardens in the UK Pavilion where it was a little cooler than being exposed in the open Florida sun. We decided to do an early lunch so that we could escape the heat on the early side but we quickly discovered that nothing in the World Showcase really serves lunch before noon which makes eating in Epcot that much more difficult. We looked at the menu at the Rose and Crown where we had the most amazing vegetable pot pie (rutabaga Wellington) last year but now it is off the menu and nothing that sounded tasty would be good considering the heat outside. So we moved on and tried to get a seat at the restaurant in the France Pavilion but they were not seating until noon and we were not sure that we wanted to wait. So we kept on walking. I talked Dominica into eating at the San Angel Inn in the Mexico Pavilion because I have always wanted to eat there. For twenty one years, since my family first came to WDW in 1987, I have always wanted to eat at the San Angel Inn which is located inside of the Mexico Pavilion between the little “market” and the “River del Tiempo” that the Gran Fiesta Tour takes place on. It has the most amazing ambiance. Min had heard that it wasn’t really that good but I had heard that it was one of the best places to eat in all of WDW and since I had always wanted to eat there (and since it was nice and cool) she decided to let me. The San Angel Inn is an extremely popular dining location in the World Showcase because of the ambiance and the widely accepted palate available for Americans but we were really early and managed to get seating for a quarter till one in the afternoon. So we had roughly an hour to kill until we ate. While Min was making reservations I strolled around the museum exhibit in Mexico. The Mexico Pavilion always has a really neat little art of Mexico display that changes on a regular basis. Right now they are doing a show on the animal carving of Oaxaca in southern Mexico. We rode the Gran Fiesta Tour and then walked over to Norway, which is right next door, and rode the Maelstrom and watched the Norway movie. Hopefully now that Norway has really done well financially on the global markets they will invest in updating the pavilion which is, I believe, the newest of the Epcot World Showcase pavilions (built between the first and second trips that I made to Disney in 1987 and 1992) because the movie is now very old and bits of the ride need some repairs. 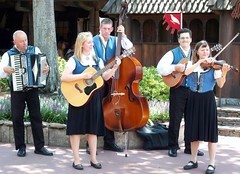 After the ride we stopped and listened to a Norwegian folk band that was playing on the street. Dominica thought it was funny that I thought that the music sounded so much like the music I would hear after coming home from school each day because my mother would often practice her accordion playing at that time of day. Then it was time to do some shopping in Mexico as we waiting for our seating time to roll around. Because we were right there in the pavilion we were able to get seated earlier than our reservation time which worked out perfectly, but not nearly as perfectly as where we were seated! After waiting for twenty-one years to get to eat at the San Angel Inn Dominica and I actually got seated, without asking or bribing, right on the waterfront in the best two person table in the house! We were very excited as the hostess walked us closer and closer to what appeared to be a water side location. It was awesome. Only about eight percent of people who eat at the San Angel Inn get to eat water side. They are by far the best seats in the house and the seats that make the restaurant really famous. As you dine the people riding in the boats on the Gran Fiesta Tour occasionally glide by on the River del Tiempo. It is like being on the ride for the entire meal. There are only a few places to eat in Disney where there are seats overlooking a ride (Pinocchio’s Village Haus has a few seats looking onto the loading area of It’s a Small World and the Garden Grill is a rotating restaurant that looks into Living with the Land) but that is about it. It is a really neat feature that I hope they think about when building new restaurants. Pleasant rides like Living with the Land are perfect spots to have the attraction and the restaurants coexist. In addition to the ambiance the food was amazing. As my readers surely know, Dominica and I are vegetarians (ovo-lacto-vegaquarians – eggs, dairy and fish) and if you look at the San Angel Inn menu there really isn’t anything vegetarian on the menu except for fish which Dominica often does not want to eat and I was not in the mood for as we already had reservations for a fish dinner tonight. But Disney is famous for being accommodating in its restaurants which are often excited to have people taking an interest in the menu and are delighted to make special accommodations for you. We made reservations at the San Angel Inn trusting that they would be able to come up with something for us. And did they! The San Angel Inn made us the tomatillo enchiladas and queso burritos. The food was amazing. It was so delicious. We were extremely happy that we gave the San Angel Inn a try. Sadly we didn’t have enough room for any dessert. After lunch we tried walking a little more but quickly determined that it was simply too hot to be outside and that there was no way that Dominica was going to be able to handle the eat so we walked back to the bus station outside of Epcot and took the Disney bus back to the Wilderness Lodge. Once back at the lodge we napped for several hours before dinner time. For dinner we had reservations at the exclusive Artist Point at the Wilderness Lodge which is one of Disney Signature restaurants. We were very excited as Artist Point is quite famous. Everyone raves about it. (Check out the current Artist Point menu.) AllEarsNet’s current menu lists the salmon dish as $34 but because the Copper River was available at the time that we were there the salmon was actually $47. Our reservations were for five thirty – right as the restaurant was opening. We got there and were seated within a few minutes. We were the second table to arrive for the evening. Dinner was awesome. Dominica didn’t want fish – she hasn’t been liking fish recently which has made dining more difficult but luckily Disney really takes care of you when you need strict vegetarian meals so it wasn’t a problem. It is just unfortunate as Artist Point is most famous for its incredible fish. (For fellow vegetarians – many of the Artist Point items mention that they include some amount of meat but simply tell your server when ordering and they will inform the chef as each item can be made without the meat.) I couldn’t pass up the opportunity to try the Copper River salmon that was the highlighted dish this week. The Artist Point menu is constantly changing but their top item is always salmon. Copper River salmon is hard to get so this was a special treat. Min got the vegetarian potato and chive pot stickers which were good but didn’t compare to the salmon. The food, service and atmosphere were really amazing. We really enjoyed Artist Point. For dessert Dominica got the famous Artist Point Cobbler and I went for the Hazlenut Chocolate Torte. It was all quite amazing. After dinner we went back to the room and changed and headed out to catch that boat to the Magic Kingdom. Tonight is the extra magic hours in the evening for the Magic Kingdom so it is actually open until two in the morning which is kind of crazy. It is really sad that Disney is no longer keeping Epcot open really late at night because it has so many great restaurants, bars and lounge areas that are perfect for a late evening in the park. The Magic Kingdom, Animal Kingdom and Hollywood Studios don’t have the same level of late night adult oriented venues like Epcot does so they really don’t make as much sense to have open so late. It is very sad that such a great piece of Disney is no longer available. Hopefully the crowds will demand that Epcot stay open later and Disney will change the closing time to something a bit more reasonable. On the way to the boat we ran into a couple who were just married on Friday who came to Disney on their honeymoon from Corpus Christi, Texas. We ended up hanging out with them for a while because the first boat was overfull and we all had to wait for a second boat to come get us as so many people were going to the Magic Kingdom all at once and we rode the boat with them so we hung out for about half an hour. It is always nice to hang out with people in Disney World. Tonight ended up being our only time going to the Magic Kingdom. In one evening, starting at seven o’clock when we arrived, we were able to do everything that we wanted to do in the Magic Kingdom with time to spare! We started in Adventureland riding Pirates of the Caribbean. We skipped the Jungle Cruise as it has a pretty long line which is encouraging because that is an original 1971 ride and it is still attracting huge crowds even when it is a Fastpass ride! Very cool. In Frontierland we did the Country Bear Jamboree which I may not have done since 1987 when I first went to the park with my parents when I was just eleven. The Country Bears are definitely one of the rides that desperately needs to be changed. I can see where it would be a neat attraction for small children but the animatronics are dated and in horrible shape, the show is really cheesy and not good for adults or children and the sound has deteriorated to the ponit where not a word of the entire show can be understood. I think that they need to really rethink this show and make it more like the new Monster’s Inc. Laugh Floor which I will talk about shortly. After Frontierland we moved on to Liberty Square and rode the recently updated Haunted Mansion. The updates were quite good. Lots of the old stuff has been updated and the ride is quite a bit nicer than it used to be. It is still very classic but works much better. No downsides to this update. Then on the Fantasyland. Dominica talked me into riding It’s a Small World which, even after all these years, I still think is completely awful. It is a combination of boring, creepy and cheap. 🙁 The people running the ride were very friendly though which, I imagine, is a daunting task, all things considered. Then it was time for Mickey’s Philharmagic – the 3D movie based on Disney’s Fantasia which is one of Dominica’s favourite attractions in the entire park and definitely the best 3D movie (since Captain EO was removed which is likely to always remain Disney’s best 3D movie.) The curtain was missing from the show though which was weird. It seems like Disney would fix that right away. The show looked a little weird because it was missing. There were a lot of people in Fantasyland so we really didn’t consider doing anything further. We continued on to Tomorrowland where we rode our all time favourite Magic Kingdom ride – The Carousel of Progress. The CoP hasn’t been updated since our last time to Disney (although the final scene really should be updated every three or four years) so we were just riding it because we love the ride. We rode the Wedway People Mover which is now called the Tomorrowland Transit Authority. It occurred to me on this trip why I don’t like this ride nearly as much as I used to (besides the fact that they removed Walt’s name from one of his brainchildren) – it is because when it was still called the WEDway People Mover the audio portion of the ride would talk about the linear engines used to propel the cars and it would discuss how this was an important technology for the future and talk about how it works. Linear motors are import for use in things like maglev trains so they are still quite relevant today. Now, instead of being interesting and educational, the ride has been really “dumbed down” and is nothing but a bizarre ride that takes you around Tomorrowland and has an announcer doing marketing for Tomorrowland shops and attractions and for things that don’t exist which is all very cheesy and weird. It’s kind of uncomfortable to listen to because it is so disconnected from reality and even the make-believe Tomorrowland of the park. It used to be a really great ride and they could fix it with nothing more than a meaningful narration! We rode Buzz Lightyear’s ride again and, Dominica will want me to inform you, she managed to beat me this time in the Buzz Lightyear Space Adventure game which is still fun, even for adults. At this point we pretty much exhausted all of the rides and attractions that we were interested in in the Magic Kingdom. Between Disney improving queue handling and us just being much better at getting around the park we seem to be able to just go from ride to ride without ever waiting in any serious amount of lines. It really didn’t seem like we waited at all the entire time although technically we did wait a few minutes at Buzz Lightyear. On the way out of Tomorrowland we walked by Monsters Inc. Laugh Floor and decided that we had plenty of time and nothing left that we wanted to do and that it had kind of looked interesting and, since there was visible line, we would give it a try. There wasn’t a line but the Laugh Floor is truly a “show” and not a ride so everyone needs to be aware that you simply have to wait for the show in front of you to finish. The wait was actually quite long and it is one of Disney’s infamous “slanted floor” waiting areas which are very tough on feet and ankles. They show horribly boring and actually annoying videos to “keep you entertained” while waiting but that could have been greatly improved. Once we got in to the actual show, though, we discovered that this really is an extremely entertaining show! The show uses human controlled video characters from the movie Monsters Inc much like the Logitech webcams for the last several years have done face recognition to allow you to animate video characters based on your real time facial movements. That is exactly what this show is. Live human actors controlling “monsters” and doing a live comedy show where they get audience participation. It was really good. We had a very good time. The show is very short, though, and ours had one of the main participants flat out refused to take part in the show which caused the whole thing to just stop for several minutes as they attempted to coax her to participate. It was really annoying having the entire theatre just sitting there waiting for one person who didn’t want to play along. There should be more warning that you might be picked at random to be a part of the show. The stuff you do is simple but if you are sick or don’t speak English or just won’t participate there needs to be a way to opt out for everyones’ sake. But overall the show was realy good. We are very glad that we tried it out. On the way out of Tomorrowland we saw where the Tomorrowland Terrace, which has a new Asian noodle bowl menu, is and are looking forward to eating there next year when we return. They have several delicious looking items. We stopped by the Main Street Bakery and picked up some items to eat back at the Wilderness Lodge later tonight and for breakfast. Then it was time to catch the boat back to the Wilderness Lodge. It was almost two in the morning when we arrived at the lodge! What a long day for us. We were really tired by the time that we got back. We ate some of our bakery products and then it was definitely time for bed. Not much sleep for us tonight as tomorrow morning we need to be in Hollywood Studios pretty early.